Welcome to the Story of Advent House - a home serving people who are in the last stages of a terminal illness. This is a story about the gracious love of God and those called to share that same unconditional love with people who have special needs at a critical time in their lives. Advent House is a home for two residents diagnosed to have less than three months to live. It serves all needs of its residents by affirming their dignity as a child of God and by providing all environments to fully live the last precious days of life. The love and support the Advent House ministry offers also embraces the family and friends of its residents and continues into the grieving process. Based on models like Isaiah House and Mt. 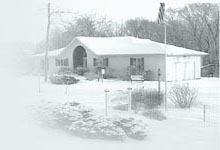 Carmel House in Rochester, Advent House offers holistic care in a home-like setting through trained volunteers who attend to residents' physical needs to keep them as comfortable and free of pain as possible while serving their spiritual, emotional, and social needs as well. The resident, family, physician, Home Care Agency, and Advent House staffs participate in determining the proper care to enhance the quality of the resident's life. Advent House began in 1987 with the vision of a small group of people in a Bible study group at Bethlehem Lutheran Church. It is now an outreach ministry of the combined efforts of the churches of Perinton known as Perinton Ecumenical Ministries (PEM). This ministry was dedicated in December, 1990 - the first Sunday of Advent. Residents are referred from a variety of sources such as physicians, social workers and pastors. Selection is based on bed availability, our ability to care for this person, and who has the greatest need. There is no fee for residents. Advent House is generously funded through the churches in Perinton, private donations, memorials, fundraisers and monthly pledges and the net proceeds from our resale store, Sweet Charity. Since 1993, Advent House became a Donor Option for United Way (#1800) listed under Perinton Ecumenical Ministries dba Advent House. Advent House is a vital ministry expressing God's love through the people in this community. Please keep it in your prayers. The peace of the Lord is with you.